The Economic and Financial Crimes Commission (EFCC) has traced N3.6bn in stolen funds to former Minister of Aviation, Stella Oduah, according to EFCC sources. 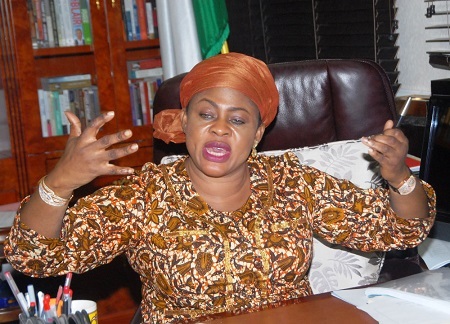 As Minister of Aviation, Ms. Oduah secured several multi-billion naira contracts to upgrade Nigeria’s 22 airports. It was later revealed that much of this money went into the minister’s pockets and that the program’s progress that she touted was grossly overstated. Documents made available to SaharaReporters showed that of the 192 contracts awarded in the second phase of the program, only six were completed. Ms. Oduah first came under scrutiny after compelling the Nigerian Civil Aviation Authority to buy her two bulletproof BMWs valued at N255m. The minister was subsequently indicted by the House of Representatives and a presidential committee for violating the country’s procurement regulations. Ms. Oduah recently obtained an interim injunction preventing the EFCC from investigating, arresting, questioning, or prosecuting her. The injunction was granted by a controversial judge, Justice Mohammed Yunusa of the Federal High Court in Lagos. However, Justice Okon Abang dismissed her injunction in February at a Federal High Court in Lagos, allowing the EFCC to commence the investigations into the N255m scandal. With permission to investigate the minister, the anti-graft agency revealed that Ms. Oduah not only misallocated N255m to purchase her vehicles but also stole N3.6b and funneled it into eight companies she created for the purpose of money laundering.